Do you love celebrating the holidays? Perhaps your favorite part is cooking a big meal for your family to enjoy. Maybe you look forward to gift giving and seeing your kids’ eyes light up as they open each gift. Whatever your favorite part of the holiday season is, it can truly be a time of happiness and good cheer. Unfortunately, while the holiday season should be one of true joy and celebration, it can also be a stressful time financially for many struggling families. When your bills are already hard to pay and purchasing food is already a struggle, the added strain of presents and big meals can be difficult to handle. Here at OUR Center, we provide personal development programs in Longmont, such as budget counseling and tips. 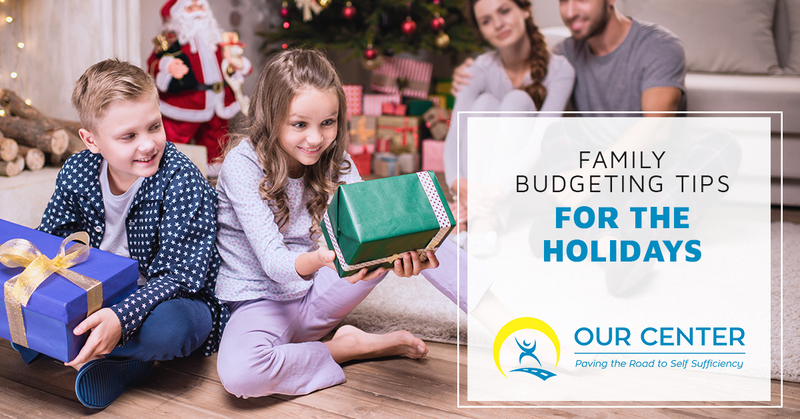 If you are struggling with how to keep your budget balanced over the holiday season, check out these useful family budgeting tips. Feel free to visit OUR Center as well for further advice and assistance. Most kids can create an unending list of toys, games, and other gifts they want over the holiday season. As a parent, it is easy to want to ensure they get every item for which they asked. However, it is not always realistic to be able to buy every single present on their list. Before you go out shopping, create an honest budget for how much you can afford to spend on each child in your home. Then, go out and buy some of the top items from their list. If you can’t afford much, don’t worry. Happiness doesn’t need to be purchased at a store. In fact, teaching your kids to appreciate and value even small gifts during the holiday season will help them become richer in spirit. Don’t feel guilty if you can’t afford massive amounts of expensive gifts. Focus instead on how you can make the holidays a fun experience for the whole family. 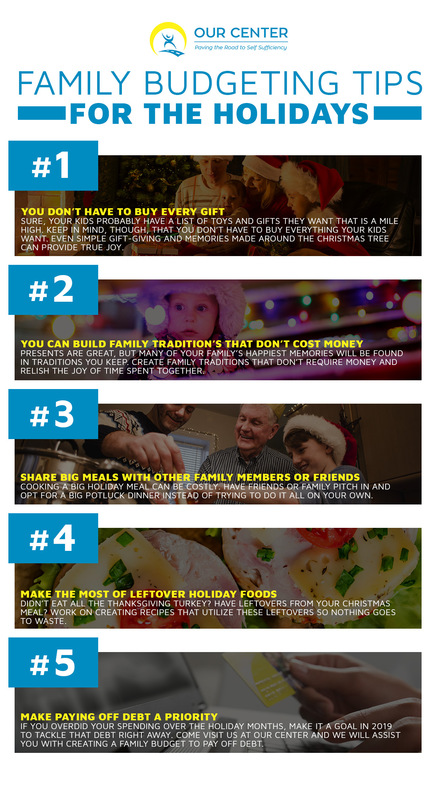 In the same vein as above, you can create amazing family traditions that everyone will cherish without spending a dime. Think of activities or events you can take part in that are free. Perhaps there is an annual Christmas parade that you can take the kids to. Do you have a fun board game that your kids are always begging to play? Make it a holiday tradition to play a few rounds of this game. Traditions don’t have to be fancy or costly. They should simply be memorable activities that you can look forward to sharing each year. Hosting a big holiday meal can be a true joy. However, big meals can come with big price tags. If you can’t afford to purchase the turkey, the sides, and desserts divvy the meal up. Invite family or friends and turn the meal into a potluck. Everyone can pitch in a little, which will make the burden less for each family. Odds are good that after a big holiday meal, there will be leftovers hanging around the house. Instead of letting these go to waste or trying to convince picky eaters to eat the same meal again and again, think of creative uses for the leftover food. You could turn leftover turkey into turkey sandwiches the next day, complete with cranberry sauce and stuffing. Ham from Christmas dinner could be chopped up and added to a tasty casserole. Make the most of what you have to prevent spending more. Finally, if you did acquire debt during the holidays, make sure you focus on paying this off as quickly as you can. Come visit us at OUR Center for free budget counseling. We can work with you to design a plan that allows you to pay your bills, buy groceries, and work on paying holiday debt off as quickly as possible. The sooner you can pay that debt off the better, as you will spend less on interest and will prevent yourself from getting stuck in a cycle of debt.